You might know that our dog, Remmy, is not just a pet. She is a member of the family. We're always sure to give her a pat on her side or a kiss on her head before we leave the house for the day. Just like Remmy is sure to greet us with a wiggle and a kiss when we return home. Just like any family member, we want to keep Remmy safe. Since the holidays can bring out curiosity in even the most well-behaved pup, PuppySpot has provided a Holiday Dog Safety Checklist to help keep our furry family member safe during the holiday season! I was not compensated in any way for sharing this info-graphic. As a dog-lover, I felt that this helpful information was a good fit for my readers. 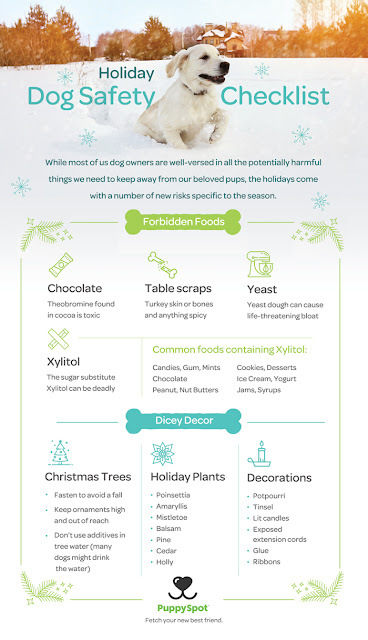 Thank you PuppySpot.com for providing this great reminder of the dangers the holidays can bring for our furry friends.